Students enrolling in the DNP program are automatically eligible for a 25% tuition scholarship. The Doctor of Nursing Practice (DNP) degree is designed for nurses seeking a terminal degree in nursing. The DNP offers an alternative to the research focused PhD in nursing. The DNP degree offered at Allen College is a systems leadership DNP. The program focuses on evidence-based practice, quality improvement, and leadership. Advocate for healthcare change through policy development and evaluation. Incorporate a firm conceptual foundation for clinical prevention and population health. Synthesize advanced practice nursing knowledge and competencies into the practice role. The DNP degree requires 1000 clinical hours beyond the BSN degree. The 1000 hours is inclusive of any clinical hours completed in a Master of Science in Nursing (MSN) degree. A gap analysis will be completed upon admission to determine the individualized number of clinical hours required for each student in order to meet the required 1000 hours. 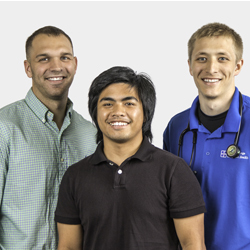 A minimum of 400 clinical hours will be completed by every student in the DNP program. Registered Nurses (RNs) in the nursing program must provide proof of current licensure as a registered nurse in Iowa. Licensure reciprocity is pursuant to the nurse licensure compact contained in Iowa Code chapter 152E.1. According to Subrule 2.8(5) nursing courses with a clinical component may not be taken by a person a) who has been denied licensure by the board; b) whose license is currently suspended, surrendered or revoked in any United States jurisdiction; or c) whose license/registration is currently suspended, surrendered or revoked in another country due to disciplinary action. Students must notify the Office of Enrollment Management if they are in violation of this code. Allen College considers admitting applicants living out of state or country. Applicants and current students must be aware select states require approval prior to Allen College offering online courses and clinical study in those states. Additionally, a state certification or governing licensing board may also require prior approval for an Allen College student to engage in clinical study within the state. Therefore, Allen College cannot guarantee out-of- state clinical or practicum placement. Allen College also cannot guarantee students maintaining residency in a state other than Iowa will be allowed to enroll in online courses. Applicants planning to maintain residency in any state other than Iowa, and planning to enroll in an online course or engage in clinical study in any state other than Iowa, should consult an admission counselor prior to applying to Allen College.